Place 30g butter in a sauté pan and add the onion and garlic, cook for 4 – 5 minutes until the onion is translucent. Add the beef and carrots and cook for a further minute or two. Pour in the gravy and red wine and add the peas. Allow to cook over a medium heat for 8 – 10 minutes until the meat is heated through and the vegetables are fully cooked. Meanwhile cut the potatoes into chunks and place in a saucepan, cover with water. Cook the potatoes on a high heat for approximately 20 minutes or until softened, strain to remove the excess water. Using a potato masher, crush the potatoes and add the warmed cream and 60g butter. Mash the potatoes well then season with salt and pepper. 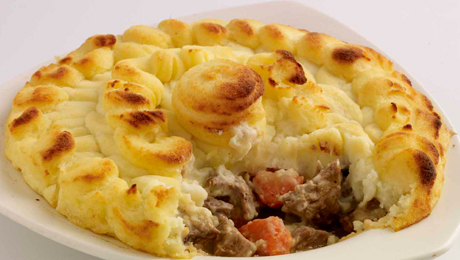 Place the meat mixture into the bottom of a casserole dish and spoon over the mashed potatoes. Place into a preheated oven for 15 – 20 minutes, until a nice golden crust forms on the potato.